We defy anyone not to be ‘Wowed’ by Lime Samui. The villa and the views are sensational and instantly create just the right holiday mood. 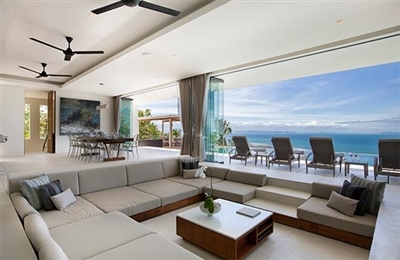 While we normally tend towards more traditional tropical villa design, we felt that this multi-level, super-modern villa fits its environment perfectly. The fresh, vibrant and uncluttered interiors are exciting and liberating, enhanced by a dramatic sense of space, light and height, courtesy of the villa’s hilltop location. 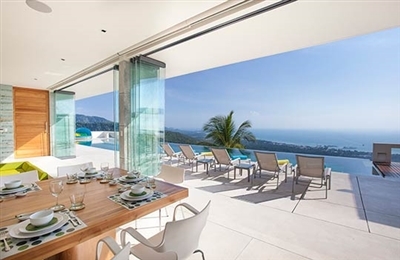 The living and dining spaces open completely to the wide pool and deck areas making it effortless to drift indoors and out as the mood dictates without ever having to tear yourself away from that view. Bedrooms are all very privately situated, comfortable and spacious, and while each of the bright ensuite bathrooms offer a similar range of fixtures, individual colours and choice of materials make them all delightfully different. We were sorry not to be able to try out the sumptuous home cinema during our brief stay (there was major power failure on the island), but have vowed to return, as this was a villa luxury not to be missed. Not sure what our excuse was for not trying the gym – it was certainly well-equipped and even this room doesn’t compromise on the view – but somehow the massage beds won out over the stairmaster! Lime Samui’s staff team impressed us in all the right ways. When we had questions they had the answers; when we wanted privacy they disappeared; when we were hungry they presented us with deliciously fresh and tasty meals. There is nowhere you can easily get to from Lime Samui without transport (unless you’re into mountaineering!) but a driver and car is provided and, as far as we were concerned, we had everything that we needed right there and no inclination to leave. We defy anyone not to be ‘Wowed’ by Lime Samui. The villa and the views are sensational and instantly create just the right holiday mood. While we normally tend towards more traditional tropical villa design, we felt that this multi-level, super-modern villa fits its environment perfectly. The bright, open-fronted interiors create a pleasing borderless freedom, enhanced by a dramatic sense of space, light and height, courtesy of the villa’s lofty hillside location. It’s easy to drift between the pool deck and the living and dining spaces as the mood dictates without ever having to tear yourself away from those views. The four king-bedded rooms are all very privately situated, comfortable and spacious, while the kids room, with its wide terrace just above the pool, is near enough to the villa’s main living areas to keep an eye on the little ones while still letting them enjoy their own space and the great facilities that go with it. Lime Samui’s staff team impressed us in all the right ways. When we had questions they had the answers; when we wanted privacy they disappeared; when we were hungry they presented us with deliciously fresh and tasty meals (do try the refreshing home-made iced pandan tea!). There is nowhere you can get to easily from Lime Samui without transport (unless you’re into mountaineering!) but a driver and car is provided and, as far as we were concerned, we had everything that we needed right there and no inclination to leave.